Welcome to the Stratford Festival blog! The Stratford Festival is a repertory theatre festival, permanently located in Stratford, Ontario, Canada. Our mission is to produce, to the highest standards possible, the best works of theatre in the classical and contemporary repertoire, with special emphasis on the works of William Shakespeare. A national institution of international renown, the Festival is committed to maintaining and promoting the highest level of artistic excellence, to cultivating the widest possible audience and to providing theatre-related education and training for Canadian artists. In our creative exploration of the great works of the dramatic imagination, we aim to rediscover and reinvent those works for each new age, in order that they may continue to entertain, enlighten and inspire audiences of all ages and origins. You can get involved by following any of our staff on twitter: follow our main Stratford Festival account, our Artistic Director Antoni Cimolino, our Executive Director Anita Gaffney or our Theatre Store. Or you can become a fan of the Stratford Festival on facebook or join us on our YouTube channel. The 2014 season runs from April 21 to October 12, featuring King Lear; Crazy for You; two versions of A Midsummer Night’s Dream; The Beaux’ Stratagem; Man of La Mancha;Alice Through the Looking-Glass; Hay Fever; King John; Mother Courage and Her Children; Antony and Cleopatra; Christina, The Girl King; and more than 150 events in The Forum. 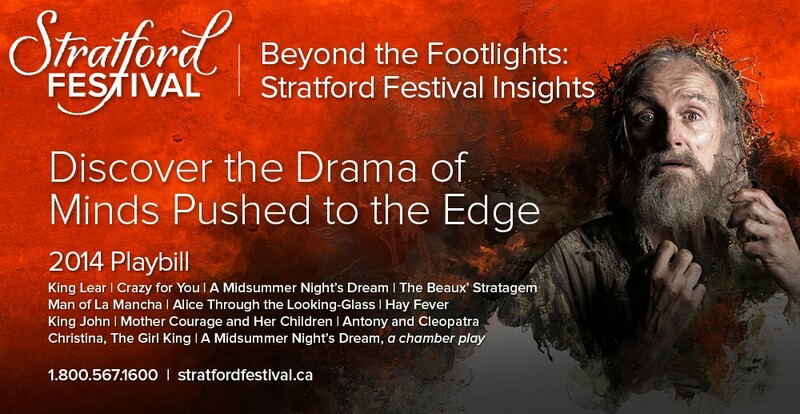 If you have any questions feel free to post them on any of our posts or e-mail socialmedia@stratfordfestival.ca! Yes, please….add me to your list! You might want to update your about page. Those plays were 2 years ago…. Please subscribe me to your blog. I can find no link on your webpage that allows me to do so. Thanks.